After Jaden's adventures in Tournament Trouble, he is dealing with his friend Cali being in Montreal and with his mother wanting him to do something else besides play Cross Ups all day long! When he is approached by the company that sponsors him to go to a tournament in Montreal, he is excited about the opportunity to compete and also about seeing Cali, who has seemed a bit off. Cali has a lot going on, with her mother recuperating from a fall and with having to live with her father's family (which includes a colicky infant!) in a new city. Still, Cali seems more sad and withdrawn, and isn't speaking to Jaden, so he want to visit her in person. This takes some finagling, but in the end Jaden and his friend Devesh are allowed to go as long as Jaden's sister goes with them. Cali's situation isn't great, but Jaden finds out that she is being trolled by another gamer who is making a lot of comments that make her feel uncomfortable. They take the train to Montreal, and Jaden leaves him bag with his ArcadeStix controller in it on the train! He worries that this will keep him from competition, but he is able to borrow one from the company. 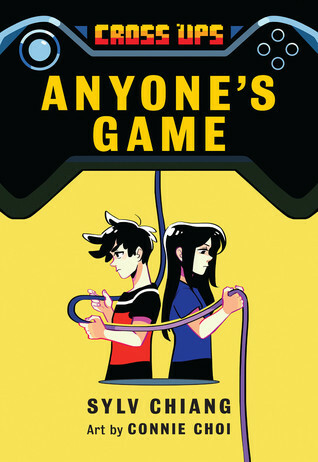 As the competition begins, Jaden starts to realize that some of the older members of his team frequently make uncomfortable comments to female players, and later finds out that Cali's stalker is at the competition... and she might have to play against him. Are the comments harmless trash talking, or something more serious? Luckily, most of the players, as well as the ArcadeStix reps, feel that these comments are inappropriate to use, and actions are taken to make sure that such occurrences stop. Strengths: There are lots of good messages in this book, and they are presented in a nice framework of easy to follow plot and light character development decorated beautifully with gaming details! Like a good sports book, if there are enough details about gaming that I sort of understand but skip over because I'm not all that interested, I know it's a perfect amount of details for my readers who do like video games! The topic of women and their treatment in these circles is very timely. Cali's life situation is difficult, but it's good to see her surrounded by people who care about her and want the best for her. Enjoyed this one. Weaknesses: I was greatly distracted by the drawing of Jaden's hair, which made it look like he had giant ears. Young readers will not be bothered by this! What I really think: Both this book and the previous one are available from Follett in a hardcover edition, and I have added both of them to my order! My son read part of the first one. He's a serious gamer and he said that it felt like the author watched a YouTube video on gaming and wrote the book so he was not impressed and refused to read more. I read more of the book, and it turns out, he was right. The author is a newbie to gaming. I wish a serious gamer wrote middle grade. I think it makes a huge difference.